My first season, I rode mostly in 3rd field. My wonderful gelding found that the excitement could be overwhelming at times and with his increased activity, he was also getting more grain. It took some time to work those things out and by opening day I was riding in second field. My horse (and I) had never been in such fabulous shape before! We were having more fun than a barrel of monkeys and I’ll admit to a tear or two when the season ended in December. There was one day in early November that really sealed the deal for me. We left a little later than our usual meet time because the weather was quite cold. It was also a Saturday, which is sometimes started a bit later as we often have friends traveling in from over an hour’s drive away. I was riding at the tail end of second field and we had several short runs after a quiet start. I didn’t know the trails at all back then but we were in the hills near the club kennels. This area has many corn and hay fields separated by stretches of wooded trails. A few jumps have been placed in the area but at the time I was sure to steer around them. My boy is smart and strong, but not the bravest… yet. After one of these short runs, while the hounds were working the scent line through the standing corn field, I had one of those vivid moments that stays with you for life. First field had followed the hounds between two corn fields when the pack turned right and headed through the corn. Riders don’t typically follow through standing corn so while they waited for the hounds to make a solid decision, they stopped. Second field also stopped, anticipating either continuing forward or letting first field double back past us and then following them. I was standing between the woods and the corn at the corner of the field with a clear view down both edges of the corn. 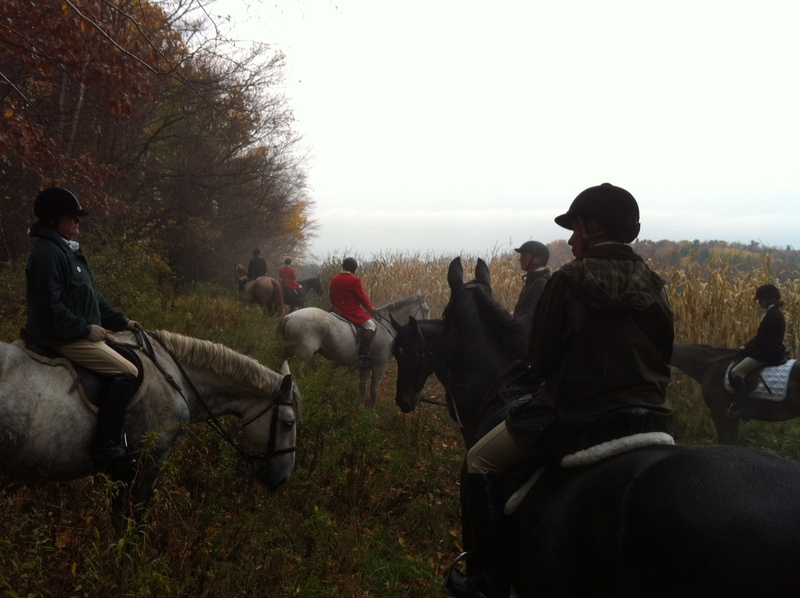 In front of me was the rest of the horses and riders, disappearing as they got further away from me into the fog. 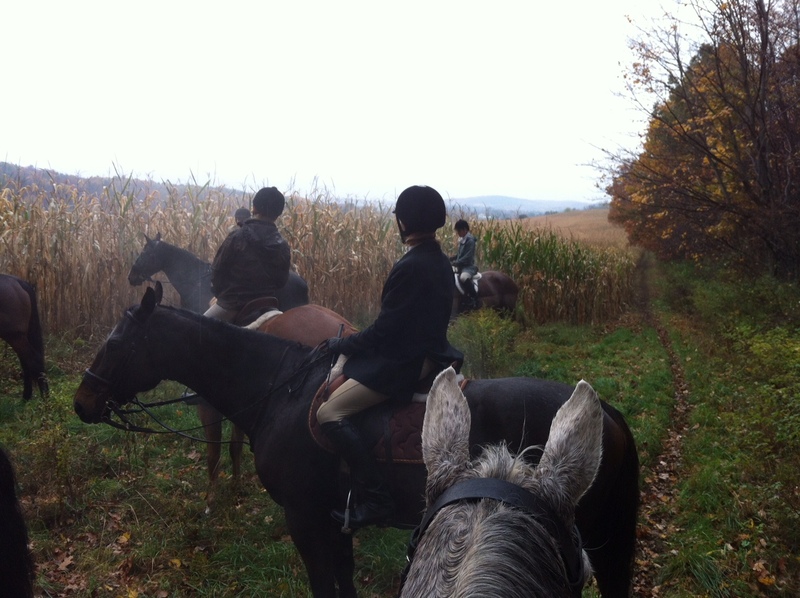 To my right was an open trail and the sound of the hounds as they moved through the dry corn. When it sways, the dried up leaves crunch and tap against each other in an unmistakable sound. A single bay or a couple hounds together would ring out from time to time. Steam rose off each set of haunches in sight, and thick winter breath came from each nose as horses and riders recuperated from the run. Every ear was pricked, in expectation of what was to come next. Each inhale took in a damp morning air scented with the earth below us, the musty dried corn, and the sweaty scent of our horses. My senses were overwhelmed and I was in a trance for what felt like ages. The trance was broken by the sight of a big white tail buck moving my way through the corn. He had been startled by the hounds and was headed for the woods. He popped into the open trail, took a couple of strides in my direction, and then bounded gracefully into the woods. Just like that, the hounds had picked up the scent and off we went again in pursuit of a stunning (and cunning) red fox. Perhaps one day I’ll paint the picture on canvas. Til then, it’ll be in my head and in my heart.